Create an ultra chic look in your home with the designer inspired Brooklyn 2 drawer bedside chest. This striking storage solution for the bedroom features a compact footprint and is finished in a stunning white high gloss lacquer that will both refresh and invigorate any interior it graces. 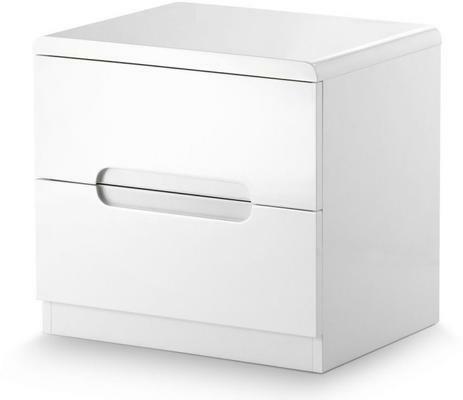 Simply oozing contemporary good looks the Brooklyn 2 drawer bedside chest includes rounded edges and recessed handles, design features which give it that added modern feel. The Brooklyn 2 drawer bedside chest is part of the Brooklyn collection which features a wide range of complementary items for the bedroom including a bed, a dressing table and a wide range of storage solutions.